For those who have lost a loved one we offer our condolences and our prayers. 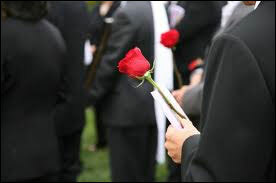 Should you require a Limousine to take you to and from the Wake or the Funeral Service please contact us. It is enough to lose a loved one and we understand, from many years of experience, how grieving family and friends wish to focus on their thoughts and memories and not on transportation. Our Chauffeurs are respectful and courteous and themselves have many years of experience in driving for such functions. We understand that you may have questions or wish to make a reservation while having a world upon your shoulders so we make the process of reserving your car and driver very easy. Our Limousines and large-party Bus Limousines are very comfortable and have all of the amenities expected of them. (Or click here to make your reservation online).